We are delighted that 5 members of IPAR’s Victorian team have been named as finalists at the 2016 ARPA Victoria, in conjunction with TAC, Excellence in Rehabilitation Awards. The awards night will be held on September 9th. We wish all our finalists the best of luck! IPAR has been awarded a 5 Star Rating (the highest possible) for Disability Employment Services across both of our sites in the North Brisbane ESA for the March 2016 ratings, released publicly on Friday 13th May. Click here to review the results. The Star Ratings system measures the relative success of providers in achieving outcomes for job seekers and is released every quarter. To achieve a 5 star result, providers have to be performing at a minimum of 40% above the national average. Impressively, IPAR’s 5 Star Ratings have been maintained since our first 5 star result in January, which was achieved just prior to the first anniversary of our entrance into the disability employment sector. It is a result of the dedication and hard work of our DES team, and their commitment to our ‘5 Star Focus from Day One’ approach. Most importantly it means we have made a difference to many people’s lives by helping them to benefit from employment. IPAR has been awarded a 5 Star Rating (the highest possible) for Disability Employment Services for its contract in North Brisbane in the December 2015 ratings, released Friday 19th February. The Star Ratings system measures the relative success of providers in achieving outcomes for job seekers, and is released every quarter. Impressively, IPAR’s 5 Star Rating has been achieved just prior to the first anniversary of our entrance into the disability employment sector. It is a result of the dedication and hard work of our DES team, and their commitment to our ‘5 Star Focus from Day One’ approach. Most importantly it means we have made a difference to many people’s lives by helping them to benefit from employment. IPAR’s 5 Star Rating result follows a perfect score from an audit performed against the National Standards for Disability Services for DES, conducted in late January. The audit was performed against six standards, with a total of 40 sub standards falling within these. Our perfect score represents the highest conformity rating against all the reviewed standards. Congratulations to our dedicated DES team on these outstanding results. We look forward to more great outcomes, especially with the recent opening of another IPAR DES office in the Brisbane suburb of Chermside. IPAR’s Managing Director, David Sagar, took home the Exceptional Leadership Award at the Australian Rehabilitation Providers Association (ARPA) Victoria Awards held on August 7th. Won for ‘demonstrated leadership in the provision of workplace rehabilitation or return to work services’, the award acknowledges the exceptional leadership that David has shown both within our organisation and the wider occupational rehabilitation industry. When David became Managing Director in 2003, IPAR had 14 employees across two states. Under his leadership, IPAR has grown rapidly with nearly 300 team members and office locations in every state and territory. David works tirelessly to foster a culture of collaboration and connection across our teams, promoting professionalism yet fun, and lives true to our organisational values. He has committed significant time and resources to ensure training and support is industry leading, and he genuinely cares and is interested in every consultant. David’s leadership has shaped IPAR’s distinctive culture, driving our high retention rates and creating our culture of high performance. Congratulations to all our nominees for their outstanding performance and ‘flying the flag’ for IPAR. The South Australian Star Rating results have been announced by ReturnToWork SA. IPAR has been awarded the highest possible 5 Star Rating for pre-injury return to work services (one of only two providers to achieve this result). This measure takes into account RTW results (measured as liability reduction), case cost and case duration and has been shown to be very robust. This is a significant achievement for our South Australian team, particularly as a relative new-comer to the market. Since the establishment of our Adelaide office in late 2013, we have applied our renowned focus on achieving positive outcomes for our customers, and this independently measured 5 Star result is a reflection of this commitment. In the latest release of Star Ratings by the Victorian WorkCover Authority (VWA) IPAR has once again been awarded the highest possible 3 Star Rating for original employer services. We are one of only two providers (out of a total of 27) in Victoria to receive the top award, which is an independent measure of Return to Work performance. This excellent result is particularly pleasing considering we have retained the 3 Star Rating for two consecutive quarters. Also noteworthy is that the 3 Star result was contributed to by all of IPAR’s 9 Victorian branches, from Mildura to Morwell and all key regions in between. IPAR’s score is 13% above the scheme median result. This means that for every 100 referrals IPAR commenced, we returned 13 more people back to full time work than the scheme median – a real testament to the dedication of our people in achieving return to work outcomes. 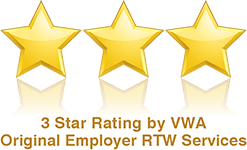 IPAR has been awarded the highest possible 3 Star Rating for Original Employer Services by the Victorian WorkCover Authority (VWA). We are one of only 5 providers (out of 27) in Victoria to receive the top award, which is an independent measure of Return to Work performance. This excellent result is particularly pleasing considering IPAR’s score is 20% above the scheme median result and is a testament to the passion and commitment of our people in achieving return to work outcomes. IPAR consultant Thi Tran was named the winner of the Best New Starter – New Employer Services category at the ARPA Victoria Excellence in Workplace Rehabilitation Awards 2014 on Friday night. Thi was one of three finalists in the category, which IPAR has now won three out of the last four years (2011, 2012 and 2014). Upon commencing with IPAR, Thi was given a particularly challenging portfolio with the majority of her job seeking clients experiencing multiple barriers to return to work. Despite being new to the industry, Thi utilised her risk management training, her strong problem-solving skills and consulted with her Psychologist-peers, to expertly handle situations and result in clients receiving timely and appropriate support and treatment. Thi’s ability to assess an individual’s level of health literacy, language skills, and education during their initial meetings enables her to tailor her approach appropriately, and quickly build rapport and generate trust. 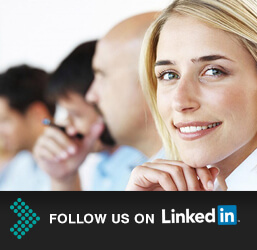 Her influencing skills are superior, motivating clients to return to work and gaining treater support for employment goals. Congratulations to Thi on this well deserved award and to all IPAR finalists on the night. IPAR was yesterday named as a finalist in the BRW GE Capital Momentum Awards 2014, in the best Mid-Market Business category. The BRW GE Capital Momentum Awards are Australia’s only awards for top Mid-Market companies, recognising high performance in revenue, profit and employee growth, as well as demonstrated innovation and industry leadership. Winners will be announced August 28, 2014 at the event to be held at the MCA in Sydney.